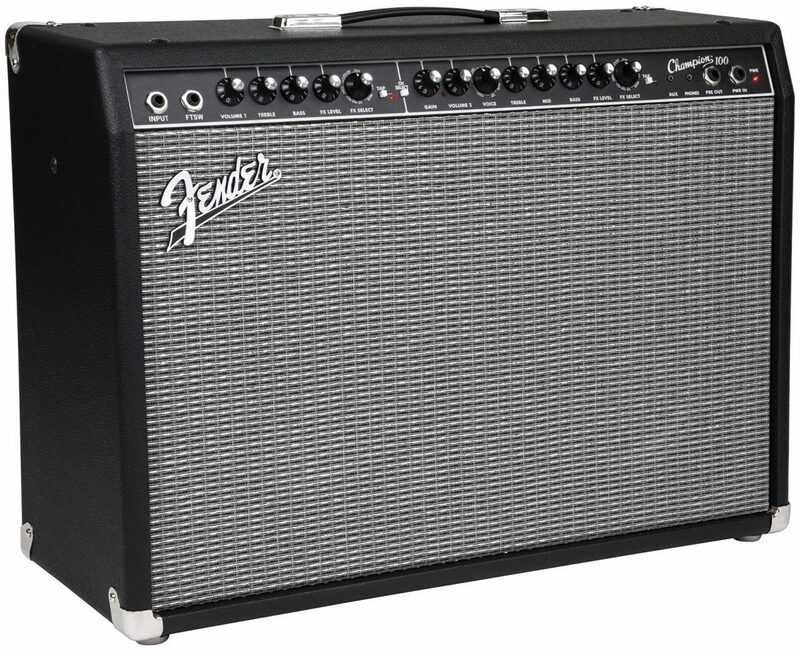 If you're ready to rock, but not quite ready for a half-stack, then the Fender Champion 100 Guitar Combo Amplifier may be right for you. Boasting two 12-inch speakers and a 100-watt solid-state amplifier, the Champion 100 is a stage amp that's big enough to rock a small audience -- with two channels, and built-in digital amp modeling and effects for versatile tones. 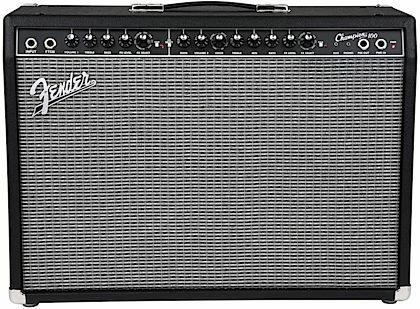 The Champ 100 is your ticket to Fender sound on a budget -- without the trouble of transporting a heavy, high-maintenance tube amp. 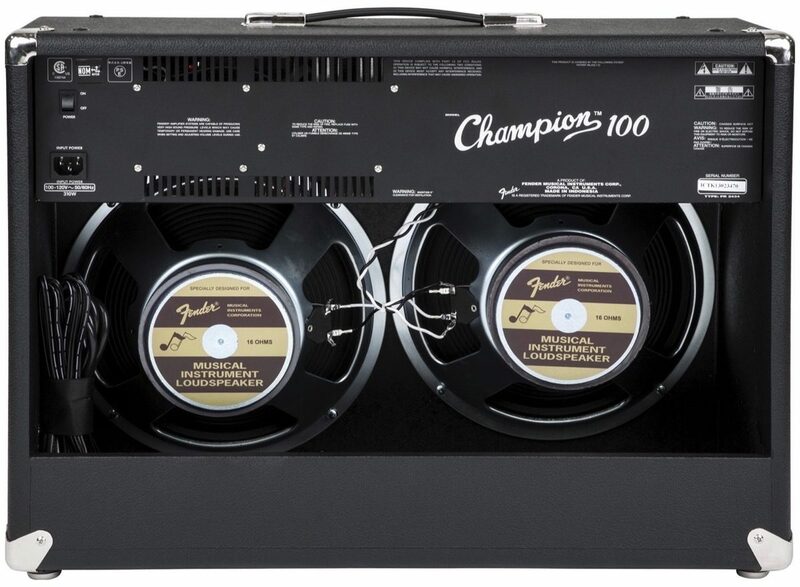 The "100" in Fender's Champion 100 stands for 100 Watts of power -- more than enough to fill a small room. But it's not always about power, and that's why the Champion 100 can be loud when it needs to be, yet still offers a soft and beautiful tone when dialed down, making it the ideal practice amp for the discerning musician or amateur gigger. While perhaps best known for their instruments, Fender has actually been making amplifiers for even longer than they've been building guitars. 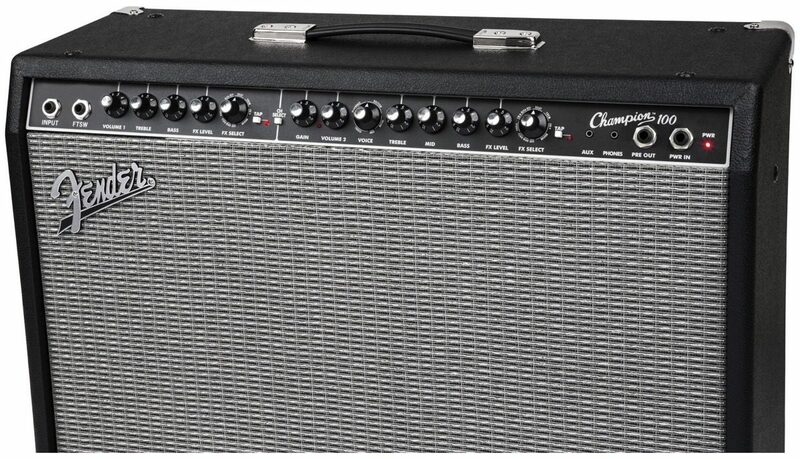 And that's why the Champion 100 is a tribute to a classic Silverface Fender Twin amplifier. 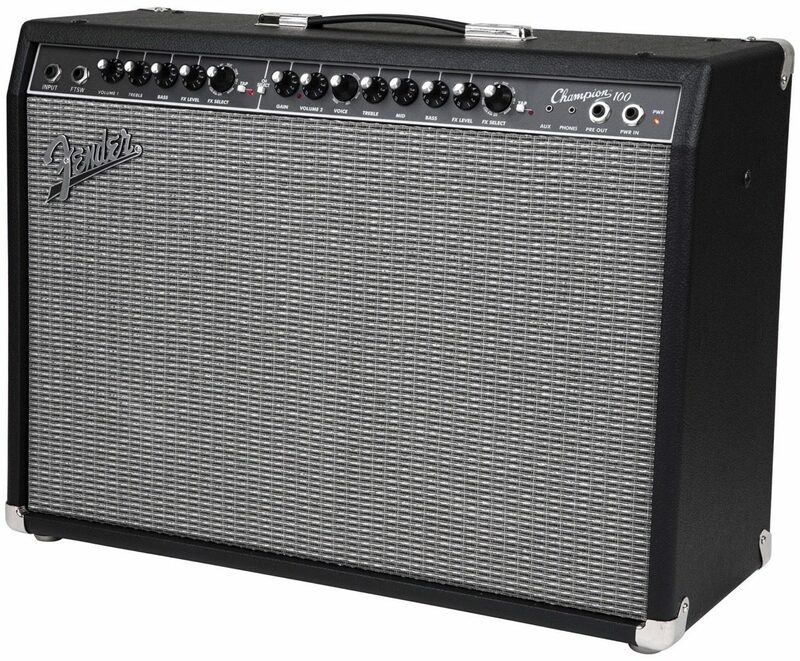 Don't underestimate its classic flair -- the Fender Champion 100 is professional-quality gear at an affordable price. - Controls: Channel 1: Volume, Treble, Bass, FX Level, FX Select, TAP. Channel 2: Gain, Volume, Voice, Treble, Mid, Bass, FX Level, FX Select, TAP. - Effects: Reverb, delay/echo, chorus, tremolo, Vibratone, and more. Delay time and tremolo speed can easily be set with the TAP button. 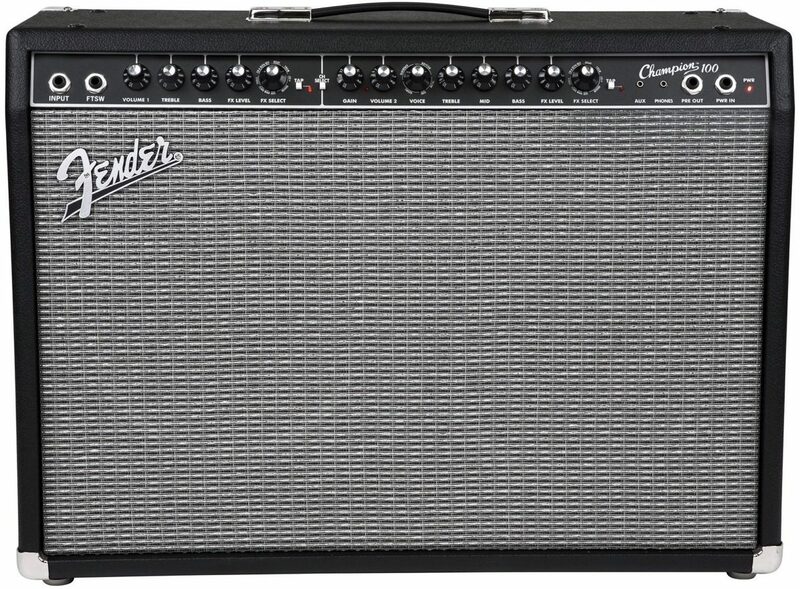 Simple to use and versatile enough for any style of guitar playing, there's a Fender Champion amp that's right for you whether you're looking for your first practice amp or affordable stage gear. The 100-watt, dual-channel Champion 100 features two 12" Special Design speakers, with great amp voices and effects that make it easy to dial up just the right sound from jazz to country, blues to metal and more. - World-renowned Fender clean and overdrive tones, plus an assortment of British and modern amp voicing and distortion flavors. 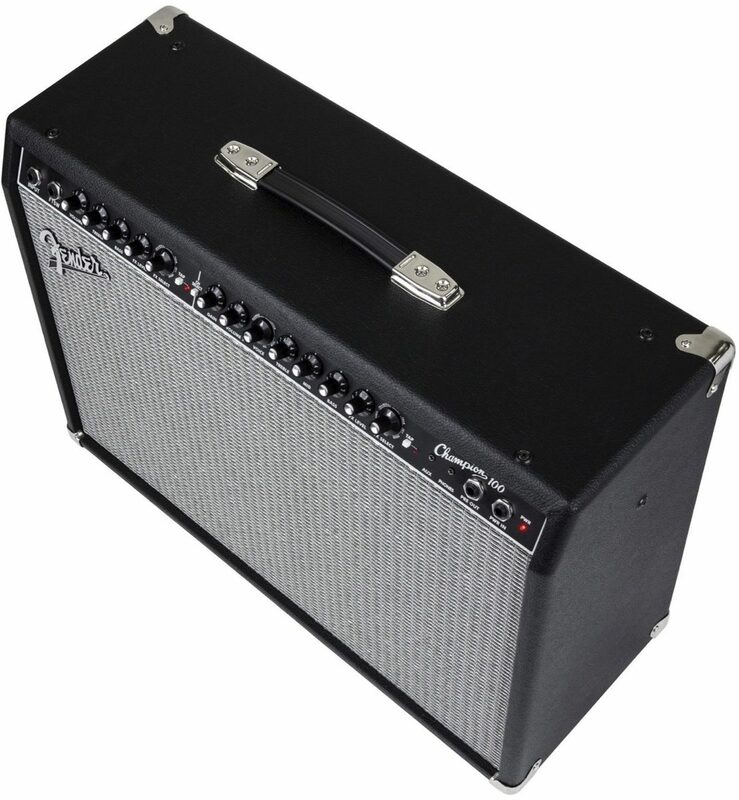 - Two channels (Channel One delivers classic Fender clean tone based on amps like the Twin Reverb, and Channel Two has selectable amp voicing). - Powerful 100 watt output into two 12" Special Design speakers. - Auxiliary input for jamming with media player. - Headphone output for silent practice. - Effects loop (Preamp Out, Power Amp In) for use with outboard effects. - Classic Fender Blackface cosmetics with black angled control panel, skirted knobs, silver grille cloth, and black "bronco" vinyl covering. "Awesome Amp and Customer Service"
Overall: I've had this amp for about a month and I absolutely love it. Beautiful clean tones and the reverb makes me happy every time. Not only is the amp great but I highly recommend zzounds. The first amp I received had a noticeably large crack in it. The return process was simple and easy. One day shipping on the replacement made the whole thing much smoother and I had a new one in no time. Don't hesitate on zzounds if the price is right! Style of Music: rock, blues, etc. 61 of 62 people (98.39%) found this review helpful. Did you? "Fender Champion 100 Guitar Combo Amp"